Flowers for Algernon is the story of Charlie Gordon, a thirty year old mentally disabled man living in New York in the 1960s. The story is told through progress reports written by Charlie. The book begins with Charlie writing about how he was chosen for an experiment that will raise his IQ and make him more intelligent, something he has been dreaming for his entire life. The experiment has already been performed on a mouse, Algernon, and proves to be successful so far. Charlie gets the procedure and as his intelligence grows, he begins to have flashbacks of his past. He also starts to realize that although he is becoming smarter, his emotional maturity remains the same. This begins to cause conflict within Charlie and he has trouble keeping the friendships he had in his life before the procedure. In progress report 14, Charlie says while visiting his father, “I wasn’t his son. That was another Charlie. Intelligence and knowledge had changed me, and he would resent me- as the others from the bakery resented me- because my growth diminished him,”(Keyes 188). He starts to see all of the things he lost just to make himself smarter, something he thought would make him have more friends. At this point Charlie creates a bond with Algernon as he completes tests on the mouse to gain further information on what the surgery is doing to him. Soon enough, Algernon’s intelligence begins to deteriorate and he eventually dies, which Charlie figures out will happen to him. Eventually Charlie goes back to his original IQ. He decides that he is going to stay at a mental institute so he can be with people like himself. Before he leaves, he makes sure to tell his doctors to put flowers on Algernon’s grave. Charlie Gordon is a thirty year old male with a mental disability. He has a mother, father, and a sister named Nora but hasn't been in contact with any of them in over ten years. Before Charlie gets his procedure, many describe him as friendly and warm. After the procedure however, Alice Kinnian, Charlie's teacher and love interest, says to Charlie, "You're different. You've changed. And I'm not talking about your I.Q. It's your attitude toward people- you're not the same human being,"(Keyes 122). Charlie becomes irritable and distant and this causes issues in how he relates to others he cares about. While reading this book, many conflicts arise with Charlie. One major conflict that effects Charlie the most is character vs. self. After Charlie gets his surgery and his intelligence begins to grow, he gets flashbacks of his past. These flashback are very difficult for Charlie emotionally because he has a different perspective than he used to now that he his intelligent. In addition, even though Charlie is getting smarter, his emotional maturity does not change. This causes him a lot of issues with relationships in his life, especially Alice whom Charlie is in love with, because he is not able to develop himself emotionally. Another conflict that can be found in this novel is character vs. society. This can also be considered a conflict because Charlie begins to realize through his flashbacks that people who he thought were his friends were only laughing at him. He sees that many of them made fun of him and his disabilities. As Charlie comprehends this he becomes angry with society and how they could not see the other side to the way they treat people like him. Charlie's conflict with himself is resolved through him reverting back to his old IQ. With Charlie being as smart as he started out as, he no longer has to be worried about flashbacks or having his intelligence progress reach higher than his emotional maturity. However, Charlie's conflict with society was never fully resolved. Even though he is able to become friends again with his old coworkers, people still make fun of him and tease him. During the last progress report, Charlie writes after a conversation with a coworker, "I felt bad because I could tell by the way he said it he was making fun of me,"(Keyes 307). No matter what, there will always be people that make fun of Charlie and that's something that may never be resolved. However, other conflicts are resolved during this book that conclude the story. The overall theme that can be found in this story is sometimes we want something so bad that we don't realize the consequences that can come along with it. In the beginning of the story, Charlie says, "I tryed the hardist becaus I reely wantd to lern I wantid it more even then pepul who are smarter even then me,"(Keyes 4). Charlie wanted to be intelligent more than anything. He believed that it would make him have more friends and people would like him better. Some of this may be the case, however there were a number of other changes that were made in Charlie that he wasn't prepared for. These changes were very substantial and effected his life greatly in ways he wasn't expecting. This caused him to question his decision to get the surgery in the first place. Charlie writes about this many times over the course of the story, giving this theme more than one piece of evidence. Charlie made a decision because all he could think about were the good things that could come. He did not consider the risks that came along with it. Realizing Charlie's mistakes in this story and not making the same is the greatest lesson that readers can take away from the novel. In my opinion, this quote is the most meaningful from Flowers for Algernon because it explains everything that Charlie has learned throughout the novel. It explains the theme and how Charlie realizes what he lost after he got the surgery. The quote gives insight to what it feels like to have conflict within yourself and not knowing how to fix it. This can be felt on a personal level for many readers, including me, and I think that's what makes it such a meaningful quote. I would rate Flowers for Algernon 5 out of 5 stars. I thoroughly enjoyed reading this story and found it very informative and eye-opening. The way the author uses progress reports to narrate the story gives readers a chance to truly get to know Charlie. I also thought the way the author used flashbacks of Charlie's life made readers aware of why Charlie is who he is. I recommend this book to anyone who is interested in medicine, mental disabilities, or science fiction because it offers many insights on these topics. Above is a video made for parents with children that suffer from a learning disorder. This relates to Charlie as he was growing up because his mother pushed him and pushed him to try and get him to learn. However, he just wasn't capable until he got professional help. 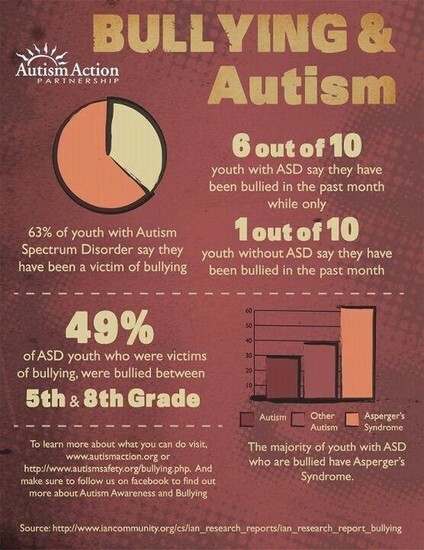 These are statistics on the bullying of children with autism, a serious developmental disorder. Above is a presentation of a lobotomy, a procedure thought to cure certain mental illnesses that took place right before the time period in which Flowers for Algernon occurred. In this picture, doctors had pushed a medical tool through the nostril up into the brain to partially cut it. Lobotomies ended in the 1950s, only ten years before this book was written. This is a scale that shows IQ scores and what the score would mean for each person at that level. Charlie's IQ started at "very low" and increased to "very superior" at the peak of his growth post surgery. The National Center for Learning Disabilities. "You Are Not Alone." Online video clip. Youtube. Youtube, 1 October 2013. Web. 10 May 2016. Autism Action Partnership. "Bullying and Autism." Autism Action Partnership. Autism Action Partnership. n.d. Web. 10 May 2016. Mical Raz. 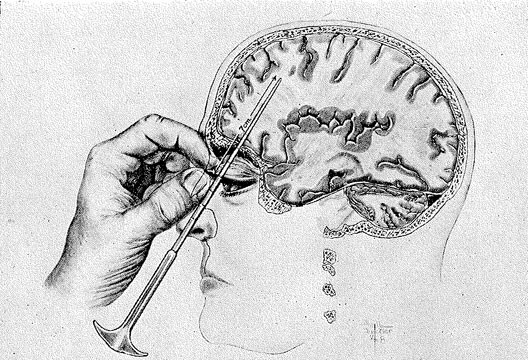 "Looking Back: Interpreting Lobotomy." The British Psychological Society. The British Psychological Society. n.d. Web. 10 May 2016. Dr. Stewart Sykes. "Exceptionality." DocSykes. DocSykes. n.d. Web. 10 May 2016. Jack Lewis. "Who are you, Charlie- A review of Flowers for Algernon." BrightonLeft. Brighton Left. 26 June 2014. Web. 10 May 2016. Alison Flood. "Flowers for Algernon's sad, sweet genius." theguardian. Guardian News. 18 June 2014. Web. 10 May 2016.